'Tabasco' Opera Makes Fiery Return In New Orleans : The Two-Way New Orleans conductor Paul Mauffray lifts the lid on a hot sauce opera that had been bottled up for a century. 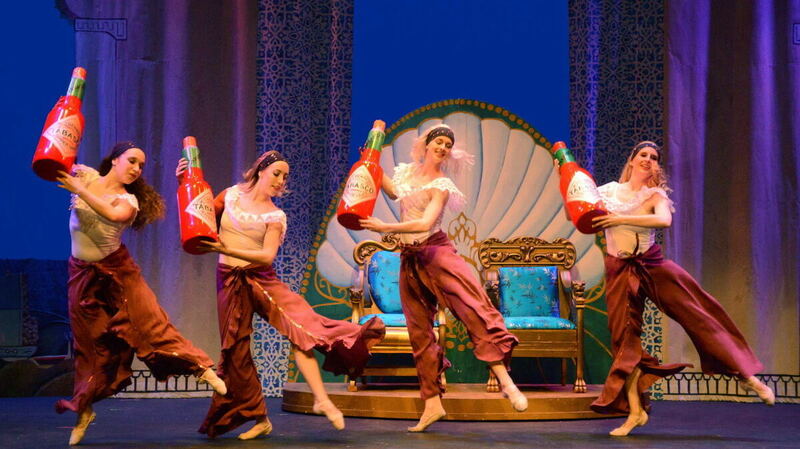 The show ran on Broadway in the late 1800s, and yes, it's about Tabasco. Dancers perform in Tabasco: A Burlesque Opera, a fiery show that makes its revival this week after being locked up for more than a century. "I knew that New Orleans had the oldest opera history in America," Mauffray said, "so I was curious to see what was part of our musical heritage." Written by George Whitefield Chadwick, Tabasco is about an Irish traveler who gets lost at sea and lands in Tangier, Morocco. There he is forced to become a chef "for a Pasha who loves spicy food," Mauffray said. "And he's gotta come up with a spicy meal, and sure enough, the Tabasco sauce saves the day." The sizzling sauce appears thanks to a trader and his sister who bring it from Louisiana. "I didn't even realize Tabasco sauce had been around that long," Mauffray said. In fact, the sauce, which is made on Avery Island, La., marks its 150th anniversary this year. Mauffray said he discovered a letter Chadwick wrote to the McIlhenny Company asking permission to use their sauce in his opera. The head of the company offered to underwrite some performance costs if Chadwick would distribute tiny sample bottles of the signature seasoning to the audience. Mauffray said he did the same in the new rendition, which McIlhenny sponsored. Reviving the opera was no mild feat. It debuted in Boston, made a run on Broadway and toured across dozens of American cities. But after a legal battle over earnings, composer Chadwick bottled up the original libretto. It was locked in a box until Mauffray discovered it in 2009. He had to mix together three different versions of the show, track down lost bits of libretto and score, and adapt some old words and jokes for current listeners. He said it took five years. "We still have the flavor of an 1890s Gilbert and Sullivan-style show," Mauffray said. The show is a hot ticket at Le Petit Théâtre du Vieux Carré, where five nights are sold out. "We're in the heart of the French Quarter, which I think is important because it recaptures that historic feeling of how it might have been performed here in 1894," Mauffray said. He said music experts often think the earliest American operas were George Gershwin's Porgy and Bess (1935) or Scott Joplin's Treemonisha (1911). "I'm sure if Tabasco had not had this horrible fate of being locked in a crate and lost, it would have become a cornerstone of our American opera history," Mauffray said.